Cut each cherry tomatoes into two pieces and keep aside. In a bowl, add chopped cucumber, corn, coriander leaves, pepper powder, sugar, cherry tomatoes, lime juice, olive oil and salt and mix well. Such a lovely salad, looks so colorful and tempting. Great clicks. 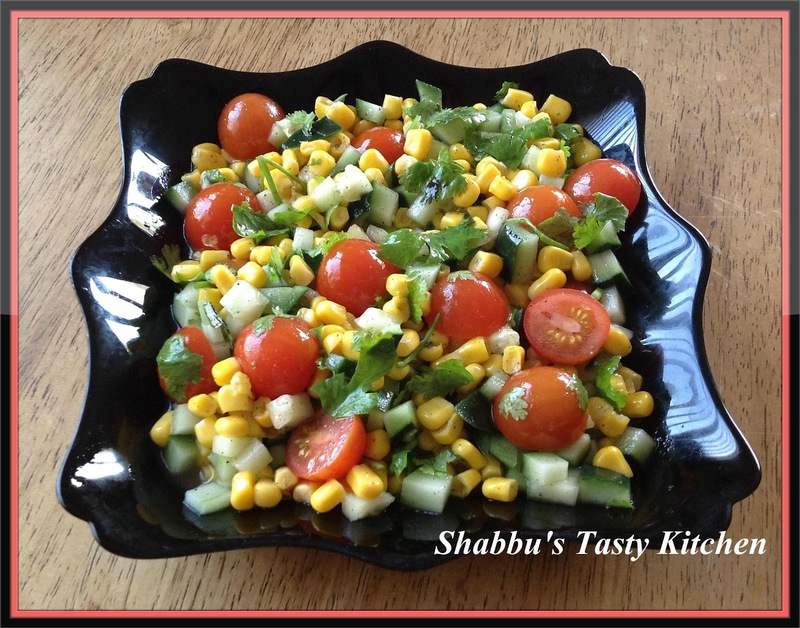 Shabbu,you are making me hungry..I loved this yummy salad! The salad is so colourful.. Liked the serving dish too. this salad is so colorful dear, perfect salad for summer as we get nice cherry tomatoes in this season. absolutely soothing and yummy looking. Super colourful and refreshing salad. Salads are my favourite. This looks wonderful and yummy..
yummy salad......perfect for the summer and perect for the kids! Perfect healthy salad, looks colorful and appetising. wow look at the colour, really loved it. Healthy and simple recipe :).. Thank u for visiting and following my blog. Happy to follow u. u have a beautiful site.